Arianespace has successfully conducted its seventh mission of the year on Thursday, Sept. 15, sending PerúSAT-1 spacecraft and four SkySat micro-satellites into space atop a Vega launcher. The rocket lifted off at 10:43 p.m. local time on Sept. 15 (9:43 p.m. EDT; 1:43 GMT on Sept. 16), from the Vega Launch Complex (SLV) in Kourou, French Guiana. The start of Thursday’s mission, designated VV07, was preceded by a nine-hour countdown, during which the launcher’s various systems, as well as an onboard computer, were activated. At about four hours and 40 minutes, safety devices were removed, clearing the way for the withdrawal of the mobile gantry, approximately one-and-a-half hours later. Then the final pre-launch checks were performed and the teams switched on transponders, receptors, and the telemetry transmitter. The launcher system was declared ready some 40 minutes prior to the flight. With all systems go, the rocket commenced a synchronized sequence about four minutes before the planned launch, leading it to liftoff. Igniting its single P80 engine, the Vega rocket started its ascent toward orbit, powered by the first stage for nearly two minutes, until its burnout and separation at an altitude of 32 miles (51 kilometers). Almost immediately, the Zefiro 23 second stage was ignited, taking control over the flight for the next one minute and 44 seconds. At T+3 minutes and 38 seconds, the second stage was detached from the launch vehicle, which was followed by the ignition of the third stage – named Zefiro 9 – 21 seconds later. During the first five seconds of this phase of the flight, the payload fairing was jettisoned, four minutes and four seconds after launch, unveiling the group of satellites heading to orbit. After the fairing separation, the launch vehicle, powered by Zefiro 9, continued the flight for about two minutes and 37 seconds, until this stage was also detached. The launcher’s lower three stages splashed down into the ocean. The rocket’s AVUM (Attitude Vernier Upper Module) upper stage was ignited about one-and-a-half minutes later and cut off for the first time at T+14 minutes and 10 seconds. The second burn of the AVUM was conducted 38 minutes after launch and lasted 89 seconds. Nearly one minute after the second burn, the SkySat satellites were released in the span of seven seconds. 14 minutes after these mini spacecraft were injected into orbit, the upper stage’s engine was ignited for the third time and was cut off 46 seconds later. At approximately one hour and 41 minutes, the fourth burn of the AVUM was carried out, which lasted 45 seconds. Some 44 seconds after cutoff, the PerúSAT-1 satellite was released into space. Afterward, about 10 minutes later, the last burn of upper stage was performed, signaling the upcoming end of Arianespace’s mission 14 minutes later. The SkySat satellites will now be inserted into a Sun-synchronous orbit (SSO) at an altitude of 310 miles (500 kilometers), while PerúSAT-1 is slated to be injected into SSO at an altitude of 432 miles (695 kilometers). Built by Airbus Defence and Space, PerúSAT-1 is Peru’s first Earth observation satellite. Weighing about 948 pounds (430 kilograms), it has dimensions of 3.3 by 3.3 by 5.6 feet (1.0 m × 1.0 m × 1.7 m). The spacecraft is based on Airbus’ AstroBus-S platform and is fitted with two solar cells. PerúSAT-1 will be operated by Peruvian Armed Forces for up to 10 years. The satellite will provide high-resolution pictures of Earth (2.3 feet / 70 cm per pixel) thanks to its New Astrosat Observation Modular Instrument (NAOMI) and its latest-generation silicon-carbide optical sensor. The spacecraft is expected to be a primary source of remote sensing data for Peru. The imagery from this satellite will be used both for civil and military purposes, with application areas ranging from homeland security and border monitoring, coastal surveillance, and the fight against illegal trafficking, to mining, geology, hydrology, disaster management, and environmental protection. “Thanks to its state-of-the-art silicon-carbide optical instrument system, the satellite will collect images at 70-centimeter (2.3 feet) resolution for use in agriculture, urban planning, border control and drug trafficking, and to support the management of humanitarian aid and the evaluation of natural disasters, among other applications. PerúSAT-1 will be the most powerful Latin American Earth observation satellite,” Airbus Defence and Space wrote on its website. The four SkySat micro-satellites, designated SkySat-4, -5, -6 and -7, were manufactured by Space Systems/Loral (SSL). Each spacecraft weighs 242 pounds (110 kilograms) and has dimensions of 2 by 2 by 3.1 feet (0.6 m × 0.6 m × 0.95 m). The SkySat satellites are operated by Terra Bella – a Google subsidiary. The company uses these satellites to acquire commercial high-resolution Earth observation satellite imagery, high-definition video, and analytics services. The four new spacecraft will expand Terra Bella’s existing network of three satellites currently in orbit that were launched in November 2013, July 2014, and June 2016. “As we continue to grow our constellation, we will be able to construct a living, breathing snapshot of any location in the world within hours, and tackle more problems around the globe,” Terra Bella noted on its website. The SkySat spacecraft are equipped with a Ritchey-Chretien Cassegrain telescope with a focal length of 3.6 m, and a focal plane consisting of three 5.5 Mpx CMOS imaging detectors. According to Terra Bella, SkySats employ a two-dimensional sensor array with a proprietary image filter to obtain high-quality images by taking multiple frames per second and stitching them on the ground, which also allows it to capture of high-resolution commercial video of Earth. The Vega rocket that was employed for Thursday’s flight is a single-body launcher with three solid-propellant stages and a liquid-propellant upper module for attitude and orbit control, and satellite release. With a height of 98 feet (30 meters) and a diameter of 9.8 feet (3 meters), the launcher is described as being capable of placing satellites with a mass of 660–3,300 pounds (300–1500 kilograms) into polar or low-Earth orbits that are used for many scientific and Earth observation missions. The first flight of this booster was conducted in February 2012. The rocket’s first stage is a one-piece solid-fuel rocket engine named P80. This stage is 38 feet (11.7 meters) tall with a diameter of 9.8 feet (3 meters). After liftoff, P80 burns for approximately one minute and 50 seconds. Zefiro 23 is Vega’s second stage with a height of 27.5 feet (8.39 meters) and a diameter of 6.2 feet (1.9 meters). The engine of this stage burns for one minute and 17 seconds. The rocket’s third stage – Zefiro 9 – is 13.5 feet (4.12 meters) in length and 6.2 feet (1.9 meters) in diameter. This stage powers the launch vehicle for two minutes during the flight. Vega’s upper stage, named Attitude Vernier Upper Module (AVUM), has dimensions of 5.6 by 6.2 feet (1.7 m × 1.9 m). It consists of two modules: APM (AVUM Propulsion Module) and AAM (AVUM Avionics Module). The first one uses an RD-843 rocket engine to boost the payload into a targeted orbit, while the second contains the main components of the avionics subsystem of the vehicle. The burn time of this stage is 11 minutes and seven seconds. 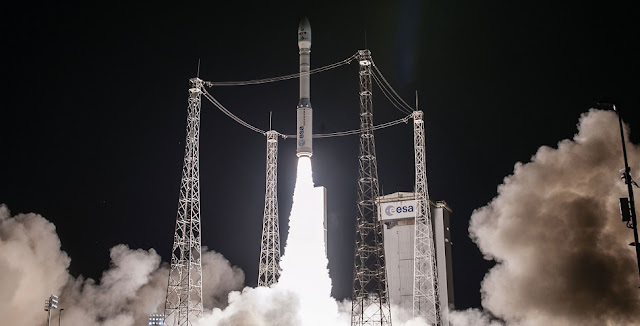 Thursday’s launch was Arianespace’s seventh mission of the year as well as Vega’s seventh flight overall. The company’s next orbital mission is currently planned for Oct. 4 when an Ariane 5 launcher is slated to loft Sky Muster 2 (NBN-Co 1B) and GSAT-18 communications satellites.